Well, the day has come, and the final installment of the Daedalus series has set sail. 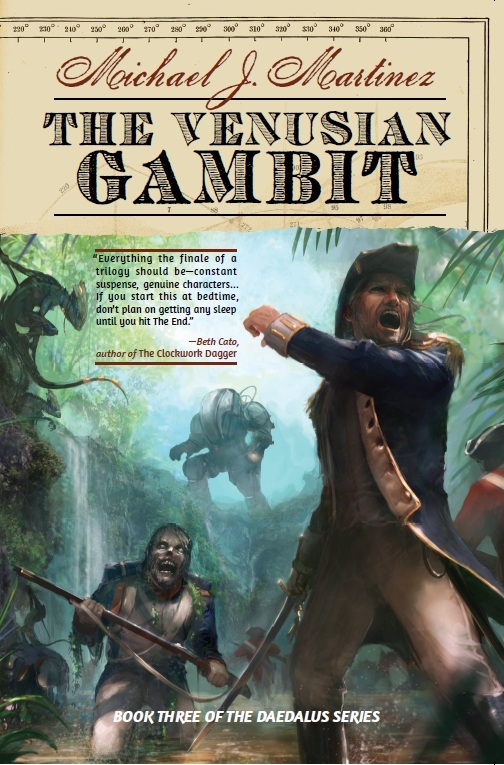 All the great reviews and fan anticipation around The Venusian Gambit have made me feel very proud, more than a little humbled…and, I’ll happily admit, somewhat relieved! I’m quite happy it’s been so well received, and grateful to everyone who’s been reading the series. Exciting action and strong diverse characters; good use of asynchronous time streams in character development…. A fine end to the trilogy that has grown along with the author…. The Daedalus series is a fun and entertaining science fantasy series that is compulsively readable. With a clear maturing of the author’s characterizations, in addition to his refinement of his sense of plotting and action in the concluding volume, I look forward to what Martinez’s pen will bring us next. To be fair, I write in Word, because a pen would be prohibitively time-consuming! But I wholeheartedly appreciate the sentiment, and I’m very grateful to Paul for all his support for the series. Also today, I wrote a guest post for Mary Robinette Kowal’s blog: My Favorite Bit about The Venusian Gambit. There were a lot of favorites in this book, from the grand battle between Englishmen and French zombies (and Venusian lizard-aliens and 22nd century mech-explorers) to the various characters that I grew attached to as they evolved through the series. But my favorite bit ended up being…well, read the guest post! The release also warranted a very nice blog post over at KT Literary, and made the new release page over at Locus. It’s been a good day. Later tonight: The now-traditional celebratory fancy beer! Because that’s how I roll. Later this week: More interesting stuff!